Once you’ve got the manuscript to the best shape it can be and you’ve formatted and prepared the book, then you have to make sure people know about it. The marketing of books is really about connecting people with a reading experience they will love. You’ve got to convince people to give your book a chance and you’ve got to hope that you’ve targeted your message to the right people who are the ones who will most love your book. No book is right for everyone! Some of these are things that I am already doing for our books and some are new things that I’m going to try on future books. There are some promotional techniques that never go out of style in book publishing; things like sending out review copies and trying to get the media interested in author interviews and mentions of the book. Then there are new techniques that are growing around the new world of ebook publishing. Those methods and ideas change rapidly and the landscape is always shifting. I find it fun and interesting to keep up with developments. To learn traditional promotion and marketing techniques I read books about book selling (so meta!) and to learn new ideas I read a lot of author blogs and writer forums. –> Announce book availability on Facebook, Twitter, Message Boards, LinkedIn, Pinterest (make sure you post in message boards where author promotion is allowed and make sure that your forum signature has a teaser and a link for your book). –> Update website’s press kit with all buy links, reviews, media, images, etc. Include an excerpt of the first chapter so people can see if they like the writing. * We’ve experimented with some ebook giveaways. 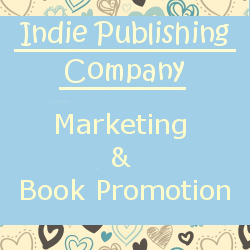 It can be great for visibility to discount or make your book free and advertise the sale. I don’t like to do that too often, though! * If you are the author or you know the author is willing, there’s lots of additional things that authors can do, such as blogging about their craft, having their own twitter, doing Q&As, speaking at panels at conventions, do guest posts on book blogs. Since the landscape is changing so quickly it’s great to read about the things other people are trying and the results they’re getting. You don’t have to try to get all the data and do all the experimenting yourself! And in the end, publish the next book. Promote the next thing and don’t get too hung up on pushing the hec out of one single title. Each title in your catalog will help promote the others. Readers who enjoy what you offer will come back again and again. Give them something new as often as you can! Once your books start selling you’re going to have a business bank account with a big (or maybe not so big) pile of cash in it. You know you want to use some of that to pay yourself, some to pay your authors but then you also know you want to use some of what’s left for advertising or for saving up for future editing and cover design. How do you keep track of how much money you have for each thing and not overdraft your account? So first, every time money comes in or goes out you record it on the account page (number 1 above). Then the balance that you have appears in “available to budget” (number two above). You divide that into each category (the first column) as you desire until the “available to budget” is zero. This way you know what every single individual dollar is doing for you! The third column (circled above) are like your envelopes. Any money you put into them stays there and builds up as each month goes by and you add more to that category. If you spend it that’s recorded on the account page (number 1 above) and it shows up in the second column, automatically updating your “envelope” to how much you have left. You can also put a note to yourself when you set up the categories if you want to have a particular percentage of your income go to each category. For example the “Cover Artwork” category could also say “Cover Artwork 2%” and each time you get money in, you put 2% of it into that category. The YNAB does allow you to be flexible, though, since you can always see how much you have in each category and if you need to pull some from something you don’t use as often for an immediate need, you can. Eventually you get to a point where you’re recording your money in as income for the next month. 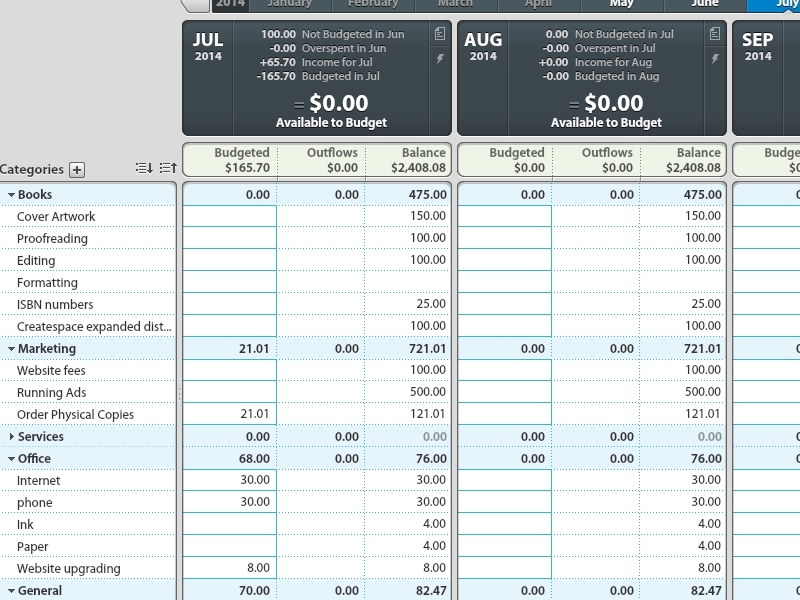 So when you get money for, say, July, you record it as available for August and it shows up in August’s “available to budget.” This way you are always working from and paying bills from money that you earned already the previous month and is in your account. There’s no speculating. It will take a few months of sales to get you there. Many sales channels, as with most businesses, will pay you in March for money earned in January. So there’s going to be a two month lag to start seeing money for your first sales. (This is called Net-60 and it means that the business has 60 days from the time you earned the money to get you paid. So for money earned in March, April first they know the full amount of March’s money and then they have 60 days so they will likely pay you at the end of May. Some, like Smashwords, only pays you quarterly and that based on how much of your money they have managed to collect from their sales channels. So there can be a bit of a wait for your cash). You can also save for yearly or irregular bills by adding a small amount to the category each month, such as paying for this website which happens annually. Here you can see some of the categories that I have. There’s also payroll, taxes, and paypal fees and a “to invest” category. I figure I can save a little bit each month until I have enough to put into a high-yield savings account and start generating some interest to put back into the business. But I’m not even close to that yet! Membership fees are for professional organizations like Romance Writers of America and small business guilds. I completely adore YNAB. 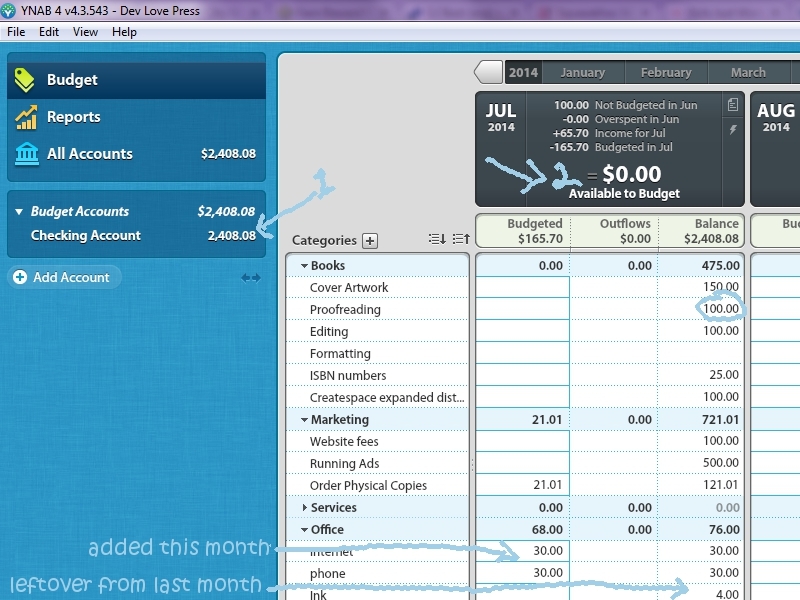 I use it both for Dev Love Press and for my household finances (you can easily create another budget and switch between them). It gives me a lot of peace of mind knowing exactly how much I have that I can spend on each thing and allows me to switch amounts around if I really want to buy a thing or a service that I haven’t budgeted enough for. That said, I have not tried many official business softwares like Quicken. In the future I may need to upgrade to a system that has payroll included in it (Right now I pay my authors through Paypal and I have a category of money just for the Paypal fees). I highly recommend trying out the free 30 day trial. Also, sign up for the web seminars teaching you how to use it. They are free and plentiful! The cost to buy it is a one time $60, however you can save $6 by buying it through my referral link here. I bought it for $54 through another person’s referral link (after the trial period I went back to her website, which is where I first heard about YNAB, and bought it through her link). You get $6 off and I get $6 for you buying it through me, so it’s a win-win. Whether you use this system or another, you’re going to need something that helps you manage your money! There’s a lot of advice on this in the book Publishing for Profit by Thomas Woll . 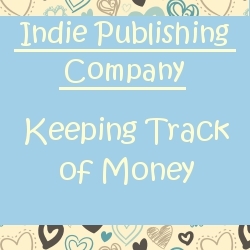 He has a ton of information about money management for publishers and some of it is a bit over my head, but I’m processing it piece by piece and integrating it into my business. He also has an appendix with recommended software for publishers that integrate sales, inventory, royalties, etc. I’ll be looking into some of those to see if they will be better than YNAB paired with a whole lot of Excel spreadsheets. The book also has a number of suggested spreadsheets for things like Profit and Loss statements (to determine if a manuscript you want to acquire will be worth the cost to produce it) and Editorial Plans, Comparison of Books Sold, etc. I highly recommend picking up a copy. It will give you a great sense of the business side of publishing! 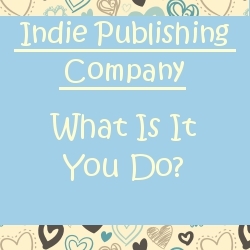 Starting a Small Press Publisher: What Is It You Do? It can be hard for people outside the book industry to understand what publishers are there for. When I told my family that I was starting a publishing company, they thought what I meant was that I’d be charging writers to format their books for them and put them up for sale. That’s what’s called an Author Services Company (or Vanity Press) and the vast majority are super scamy. If you’ve been a writer for any amount of time I’m sure you’ve heard the saying that publishers don’t charge authors, they pay authors. You as an author should never be asked to pay fees or to pay for publisher’s services. That’s because authors are not a publisher’s clients. The authors are not my clients. The authors are, to make an analogy, my manufacturers. They create the product that I then sell. (By the way, going back for a moment to the legal side of things, my accountant has told me that the authors are 1099 contractors for me and as such I need to have them fill out a W-9 form providing either their social security number or the EIN of their own business identity in order to report on taxes how much I’ve paid them. Check with your own accountant about this). So who is my client? Readers. Anyone who buys books. What’s the problem with Author Services Companies? As with most things, you have to look at what the incentives are. If I’m making money from charging an author to edit her book or format his book, then what motivation do I have to hussle and sell that book? I’m already making money! Why would I care if it sold? I would be incentivized by the wrong thing. The way publishing companies are set up is that we get paid when the book sells. We are incentized and motivated to sell that book as much as possible because the more money it brings in, the more money we all make. I could have created a company around charging a small fee to format someone’s book or upload it to Kindle for them, and there’s be nothing wrong with that (as long as I was upfront with the authors about what service I’m providing), but that’s not being a publisher. That’s not the business I’m interested in being in. Get the book ready to sell and then sell it! Basically all the things on this list I either do or coordinate the hiring of someone to do and then I do all the publicity and talking to bookstore reps too. I hope that this series is illuminating the many things that a publisher does do for their authors’ books…there’s plenty of work left between finished manuscript and finished book!